BANGI, 9 June 2014 – Malaysia needed some 50,000 counsellors but currently only 5,082 are registered as counsellors with the Counsellors Board of Malaysia. 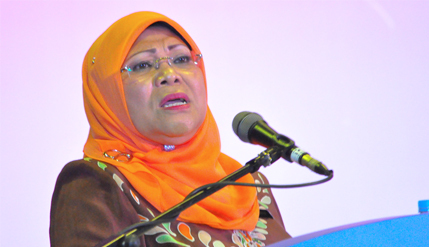 Minister of Women, Family and Community Development Datuk Rohani Abdul Karim said the situation is critical as more Malaysians are becoming comfortable and trusting in getting the services of counsellors for work related stress, trauma, family and marital problems. Speaking when opening the Bicara Sakinah Programme at The National University of Malaysia (UKM) here recently she said 50,569 Malaysians have sought the services of counsellors since it was made available in 2006 through the National Population and Family Development Board (LPPKN). The Bicara Sakinah programme is part of the Yayasan Dakwah Islamiah Malaysia (YADIM) fair on Islam which was held at the campus here recently. She said counselling is greatly sought after especially to help settle problems over marriages. LPPKN now have 69 counsellors providing their services at 59 clinics it runs. LPPKN is also broadening its reach by providing counselling for families through having ties with other government agencies and Non-Governmental Organisations (NGOs), such as Islamic Development Department (JAKIM), the National Registration Department, Department of National Unity and Integration and others. Rohani said many universities in the country have produced thousands of psychology graduates each year and urged them to register and practice their trade as counsellors. Speaking to journalists after officiating the Bicara Sakinah programme, Rohani said it was important that they register as counsellors. Their registration will allow the government to do background checks to see whether they have the right credentials, experience and skills to become a licensed counsellor. It will also allow the ministry access to them should anything untoward happened like a national crisis that needed their services. Rohani said her ministry was in a crisis mode when MH370 went missing with the arrival of families of the passengers who needed counsellors to help them cope with the very trying situation. “To begin with we have very few counsellors and then we had to find from that limited number those who could speak Mandarin and English. Mandarin speaking counsellors were very hard to find at that time and even when they could speak Mandarin, the differences in Malaysian Mandarin and China Mandarin made things worse,” Rohani said. She also related the difficulties faced by the Ministry and its counsellors over the incident where a 15 year old girl was gang-raped in Kelantan first because the girl was under heavy treatment and then stopped by her parents because she was too traumatised that she could barely speak. Nonetheless the ministry will continue to do all it can to monitor the victims’ progress in her recovery, Rohani said.